Looky-Loos or Active Fans: How Is Live Music Fueling the Occupy Wall Street Protests? We’ve been following the Occupy Wall Street protest as it continues to develop and grow. And we wanted to open up a discussion and start an exploration of how live music is being used to fuel the movement, bring solidarity, or maybe even distract supporters. The first big announcment of live music being involved when was Radiohead rumors started floating around saying that the band was going to show up for a surprise concert. Well, that never happened. And since then a handful of other bands and artists have popped up to play surprise shows and support the protesters. For starters, Pitchfork and The Village Voice reported sets at Liberty Square by Jeff Magnumon of Neatrual Milk Hotel and rapper Talib Kwalei videos of both sets are below). And then Anti-Flag is scheduled to perform today at 3pm. To bring a bit of context to the situation I’ve checked out the movements “unofficial” website and this is how they describe their movement. I also came across this CNN article that helps to put the purpose and impact of the protest in proper context. Occupy Wall Street and its offshoots have clear strains of liberal economic populism — a powerful force in U.S. history during times characterized by economic stress. That said, it would be a mistake to label or tie the movement to a specific agenda, said Susan Olzak, a Stanford University sociology professor. And to Olzak’s point, it’s too early to say how things will turn out, so we’re going to continue to cover this story and specifically explore how live music continues to impact the Occupy Wall Street protests. How Does This Movement Compare to Others? Looking back at our other explorations, I’m wondering how this movement compares with past movements that used live music to rally the troops. For example Woodstock was a complex mashup of introducing the counterculture to a wider audience as several bands protested the Vietnam war and other social injustices. What are there similarities and differences between past live music protest moments like Woodstock and what’s going on at Liberty Square and in other cities today? What can we learn from the past about how rock, pop and hip hop was used or misused to protest war, greed and other social injustices? And after talking with Egyptian band Massive Scar Era about how local bands exploited the Cairo protests to promote their music, we should all keep a close eye on other bands who might do the same on Wall Street. Of course we all know that live music never creates a movement. It just gives voice to it. And I believe that this is truer today than it’s ever been because most live music fans see the concert experience as a place to be entertained, escape or to have their emotions, spiritual beliefs and psychological state reinforced. And that’s totally okay with me because there’s still immense value in that type of environment. And in most cases, fans don’t come to a show to be swayed politically or morally either. And rarely do most fans actually participate in the show. But what’s interesting is that with the Occupy Wall Street shows the bands are the ones coming to join the show instead of the fans coming to see band, which creates an intriguing dynamic to watch unfold. Thinking in those terms, I wonder if the artists could be hurting the movement because having the bands come could make the fans slip into a state of passive entertainment and become just another “Looky-Loo,” a person who comes to a show only consume and not truly participate, as Dave Hickey wrote in his fantastic 1997 essay Romancing The Looky-Loos. We’ll be exploring more about what it means to be a Looky-Loo later, but I wanted to introduce the concept on this post because it made sense in light of the artists coming to join the protests on Wall Street. Of course, there are always exceptions to the Looky-Loo rule and each generation always brings something new to the protest table. That said, I expect a lot of unexpected things to happen knowing that we have protesting and concert fans emotions mixed together in a very volatile and dynamic melting pot. Have you been at the Occupy Wall Street protests? Are you afraid of becoming a Looky-Loo? How do you think live music will impact the protests? Let us know what you think in the comments below and we’ll share your story during a future episode of Live Fix Radio. Talib Kweli, “Distractions,” at Occupy Wall Street from Village Voice Media on Vimeo. 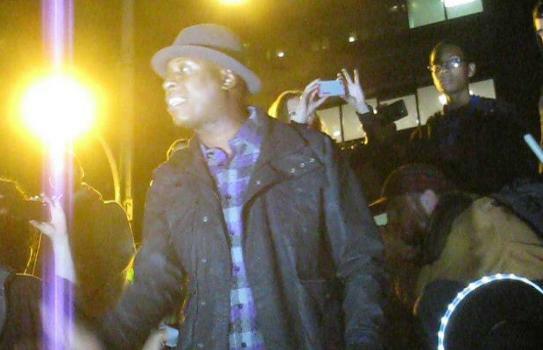 Talib Kweli Speaks to Occupy Wall Street from Village Voice Media on Vimeo. Will You Get Emotional During Michael Jackson Tribute Concert on Facebook?